During the sixteenth century, a group of remarkable Italian anatomists studied and identified structures in the inner ear. Berengario Da Carpi described the ossicles (middle ear bones) in his book Commentaria (1521), and Giulio Casserio compared these bones in various animals. Heinrich Rinne described the conductive process between the tympanic membrane and the ossicles and used the tuning fork to differentiate causes of deafness (1855), and Hermann von Helmholtz postulated the perception of sounds and tones (1863). Unlike the senses of smell, taste, and vision, hearing exclusively utilizes mechanical processes. An object produces sound when it vibrates, usually through air or water. Sounds transmitted as waves are characterized by their frequency (cycles/second, cps, or hertz, Hz), which is perceived as pitch, and by amplitude, the size of sound waves, sensed as volume. The hearing process involves directing sound waves, sensing fluctuations in air pressure, and translating these fluctuations into signals interpreted by the brain. The outer ear collects sound waves and directs the sound to the tympanic membrane (eardrum), the boundary between the outer and middle ear. The sound enters the ear canal and causes the eardrum to vibrate. This air pressure is amplified by the ossicles, three tiny bones in the middle ear, which push on fluid in the inner ear through an opening in the cochlea. The cochlea converts sound pressure waves into electrical impulses that are sent to the brain. The cochlea consists of three adjacent tubes that are shaped like a snail shell (hence, this structure’s name), which are separated by membranes and lined by hair cells. When the hair cells are bent by the sound waves, they become excited and create impulses that are sent to the brain. The cochlea differentiates between the pitches and intensity of sounds based on vibrations in membranes along its length. Vibrations at the entrance of the cochlea respond most actively to high frequency sounds, while those at the opposite end reacts to sounds of low frequency. High amplitude (louder) sounds cause the membrane to vibrate more vigorously than low frequency (soft) sounds. SEE ALSO: Sense of Taste (1974), Sense of Smell (1991). The cochlea, a spiral-shaped cavity of the inner ear that contains nerve endings essential for hearing, takes its name from the Greek word kokhlias (“snail”). 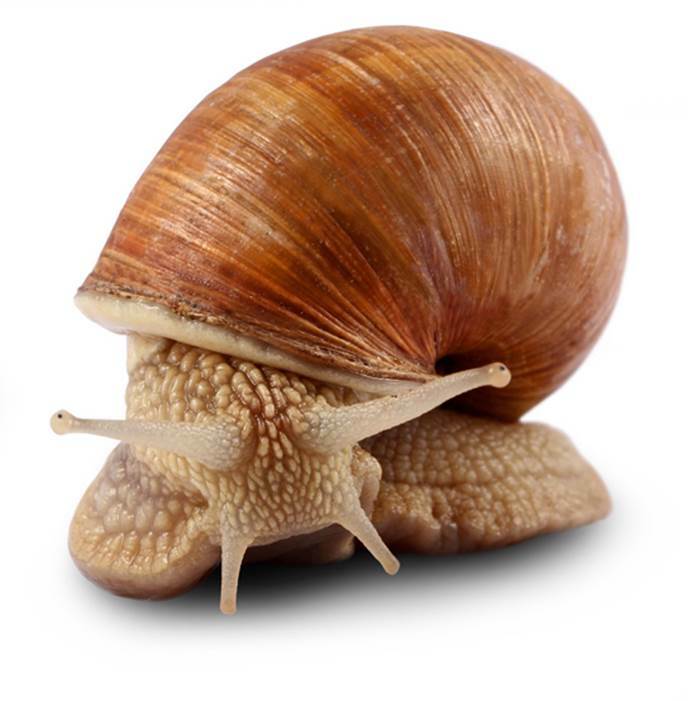 As such, it evokes the spiral shell of the garden snail (Helix aspersa, shown).